Establishing a new relationship with an Independent IRB may seem complicated. We help make it easy with an efficient, connected, and flexible approach. 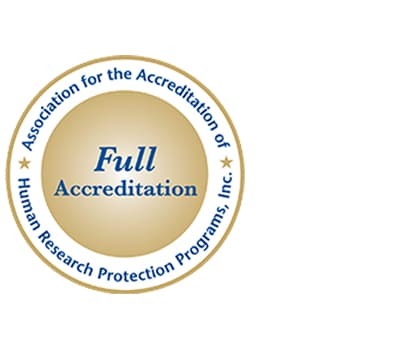 We have full AAHRPP accreditation, which was granted in 2006. We also have 20 years of experience serving as an IRB for multi-site research studies and a local IRB to academic medical centers, research organizations, and research sites. We understand that institutions need to stay connected to all their studies and oversee their entire research program. Our Connected IRB Model helps maintain this connection by promoting communication across the key institutional stakeholders and serving as an extension of your research team. This includes email alerts for investigators and research coordinators as well as specific alerts for critical study concerns such as unanticipated problems involving risks to subjects or others. Our staff works closely with the institution’s leadership, IRB administration, and research compliance representatives to understand the specific requirements and preferences for working together. Our clients have expressed their appreciation for this level of involvement. It helps pave the way for strong and successful relationships. Many of our IRB committee members are physicians, pharmacists, and nurses from leading academic medical centers. Representation on our IRB committee includes thought leaders from a wide range of therapeutic areas with diverse backgrounds and decades of experience as IRB members. BRANY staff includes Certified IRB Professionals, legal experts, and research professionals many with more than 10 years of experience in IRB administration. Your team will also be given access to IRBManager™ for online study submission and management. Our compliance department routinely screens active research and selects studies for in-person or remote compliance review. This helps organizations meet their post-approval monitoring goals. BRANY IRB can serve as the Privacy Board if needed. We can help ensure applicable requirements of the HIPAA Privacy Rule for use or disclosure of protected health information for research purposes are met.